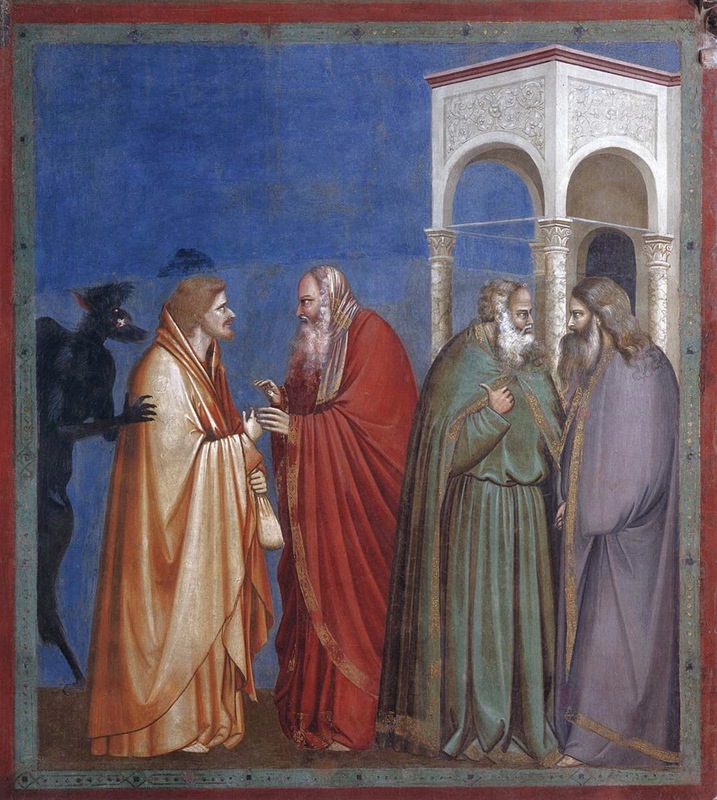 The Betrayal of Judas, as depicted by Giotto in the Scrovegni Chapel in Padua, Italy, 1304-06. On the following day, the Divine Liturgy of the Lord’s Supper is sung together with Vespers; the Stichera, sung between verses of Psalm 140 while the church is incensed, are a series of poetic compositions about the betrayal of Judas, several of which also refer to the woman who anointed the feet of Christ. Judas the transgressor, o Lord, who dipped his hand with Thee in the dish at the supper, lawlessly stretched out his hands to take the silver pieces; and he that reckoned up the price of the myrrh, did not shudder to sell Thee, that art beyond price; he who stretched out his feet to be washed, deceitfully kissed the Master to betray him to the lawless; cast from the choir of Apostles, and having cast away the thirty silver pieces, he did not see Thy Resurrection on the third day; through which have mercy on us. Judas the slave and deceiver, the disciple and plotter, the friend and accuser, was revealed by his deeds; for he followed the Teacher and with himself he plotted the betrayal; he said to himself, ‘I shall hand him over, and gain the money that has been agreed upon.’ He sought for the myrrh to be sold, and Jesus to be taken by guile; he gave a greeting; he handed over Christ; and like a sheep to the slaughter so did He follow, that alone is compassionate and loveth mankind. Judas is truly of the generation of vipers who ate the manna in the desert and murmured against the One who nourished them; for while the food was yet in their mouths, the ungrateful ones spoke against God; and he, the impious one, while bearing in his mouth the heavenly Bread, devised betrayal against the Savior. O insatiable mind, and inhuman daring! He sold the One who nourished him and handed over to death the Master whom he kissed; truly the transgressor is their son, and with them he has inherited destruction. But deliver, o Lord, our souls from such inhumanity, Who art alone boundless in long-suffering.